High Point Furniture Market is often thought of as new furniture but there is this jewel of an antique mart in Market Square. It is always one of my favorite spots to peruse during my time there. It is always alluring and this past Sunday was no exception. Also, let me apologize if you follow me on Instagram. I know the clown was scary but it was one of the fascinating things I came across in the antiques area of Market Square. From clowns to amazing silver, I was captivated by all of the different things. I’m in love with this chair. From the blue painted swans to the monogramed arm, what isn’t to be curious about? One thing is for certain this chair was created for someone unique! No one boring would have had the vision for it. I wonder what stories it could tell?? Horns and antlers were all over market again. My favorite way to see them is to style a lot of little ones together as you see this antiques dealer did. 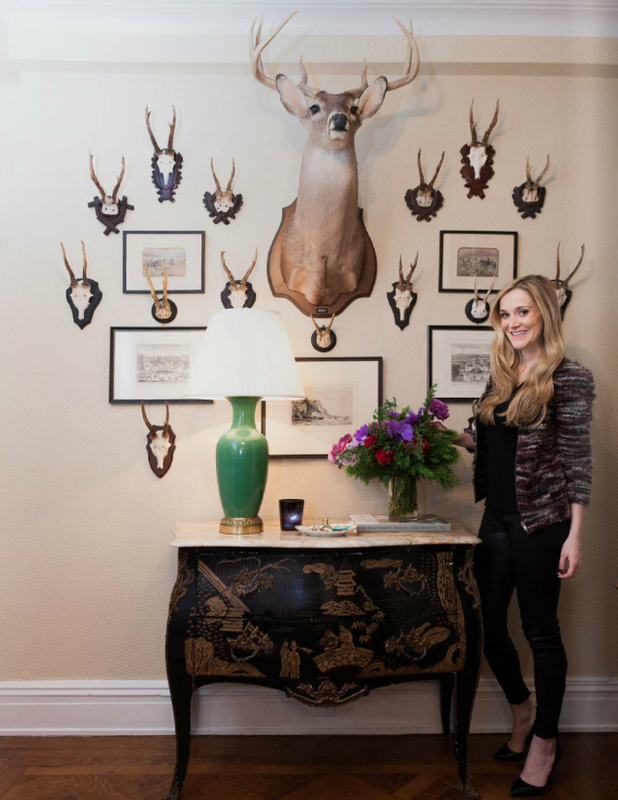 Here is another example from Matchbook Magazine’s January 2014 article featuring CeCe Thompson’s apartment. My intern thought I wasn’t half boring when I pointed out some stunning Louis Vuitton vintage luggage… wouldn’t it be fun to have a stack in your closet? Finally, to me there is something about old desks, pews, and benches like the one below. I love to think about the stories that these seats could tell… I wanted to know where it from an old auditorium, airport, or theater?? I didn’t get any answers but I’m still curious. I am also in awe of the artwork behind it. What a great use of color as a backdrop to this series of seats?? Someone did a great job pairing them together. I’m back to High Point today for one last look before market comes to a close! What would you want to see? Let me know!! PS – Have you participated in my Raffle yet??? Going on until FRIDAY!! !